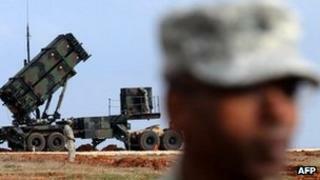 The US will keep Patriot missiles and F-16 fighter jets in Jordan after a military exercise, angering Russia. Pentagon spokesman George Little said the US enjoyed "a long-standing partnership with Jordan" and was "committed to its defence". He said all other US military personnel would leave Jordan next week. But Russian Foreign Minister Sergei Lavrov warned that any attempt to use the F-16s to impose a no-fly zone over Syria would violate international law. He also dismissed accusations made by the US on Thursday that Syrian government forces had used chemical weapons on a small-scale multiple times. He suggested that the US had no reliable evidence and questioned how the US had collected its samples. The Syrian government has also denied using chemical weapons. US officials have said their assessment was based on physiological samples, intelligence on government plans for the use of chemical weapons, accounts of alleged attacks and descriptions of symptoms experienced by victims. Mr Lavrov argued that it made "no sense" for President Bashar al-Assad's supporters to use chemical arms because "the regime has not been driven into a corner". Syrian pro-government media have reported that the military is preparing for a major offensive on the northern city of Aleppo after recapturing the western town of Qusair with the help of fighters from the Lebanese Shia Islamist movement Hezbollah. Mr Lavrov's comments come as Moscow and Washington attempt to persuade the government and opposition to attend an international conference to find a political solution to the two-year-old conflict which the UN says has left more than 93,000 people dead. In a telephone conversation with his Iraqi counterpart on Saturday, US Secretary of State John Kerry warned "the use of chemical weapons and increasing involvement of Hezbollah demonstrates the regime's lack of commitment to negotiations and threatens to put a political settlement out of reach". On Monday, US President Barack Obama will meet Russian President Vladimir Putin at a G8 conference in Northern Ireland. The two leaders are expected to discuss Syria, including the US decision this week to begin sending weapons to rebel forces. In a separate development on Saturday, Egypt's President Mohammed Morsi announced that he was cutting off diplomatic relations with Syria. Addressing a rally in support of the Syrian opposition, Mr Morsi said that the Syrian embassy in Cairo would be closed and Egypt's representative withdrawn from Damascus. He also demanded that Hezbollah withdraw from the fighting in Syria, and called on the international community to impose a no-fly zone.